Vegan Runner Eats » Traveling » Adventures in Seattle, Wa., and Beyond. Pike Place Market. Sabra’s Mediterranean Food. Adventures in Seattle, Wa., and Beyond. Pike Place Market. Sabra’s Mediterranean Food. As you may know, I’ve spent the last couple weeks in Seattle, WA area. Naturally, there’s been a lot of traveling around and exploring the area, and discovering a lot of lovely places along the way. 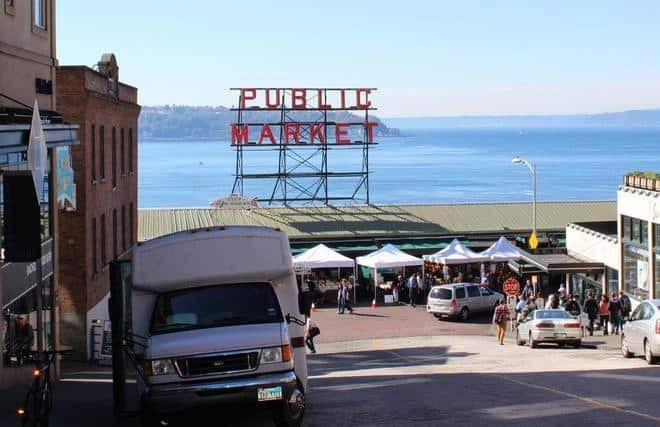 Today I’m going to talk about the legendary Pike Place Market in downtown Seattle – one of the oldest and most famous markets in the United States (and also the place where the first Starbucks store opened back in 1970s). 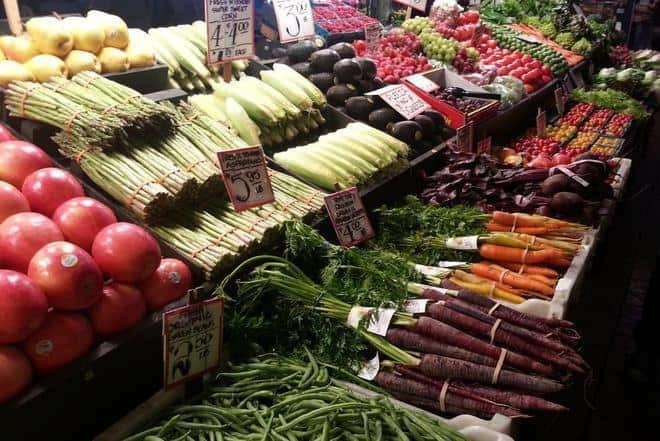 Pike Place Market was opened in 1907 in an effort to let people buy produce and other farm goods directly from farmers, avoiding high wholesale prices. The market has thrived for over a hundred years and managed to escape demolition in 1960s. Its historic buildings are now guarded by Pike Place Market Preservation and Development Authority. 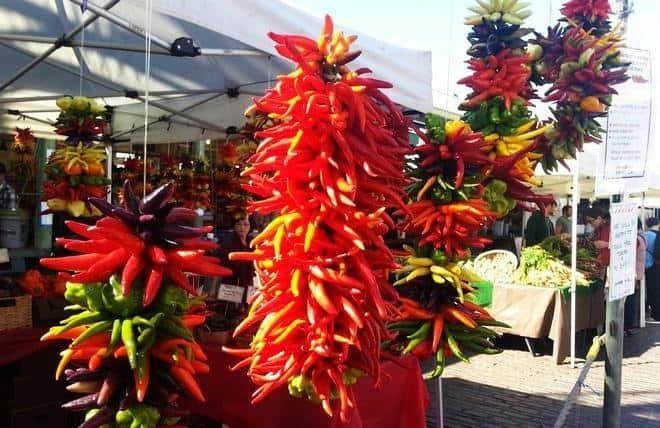 Farmers and crafters of different kinds from all over the area sell food, flowers, handmade clothing, jewelry, souvenirs, etc. While there are thousands of things for purchase in Pike Place Market, guess what I loved the most? THE PRODUCE! 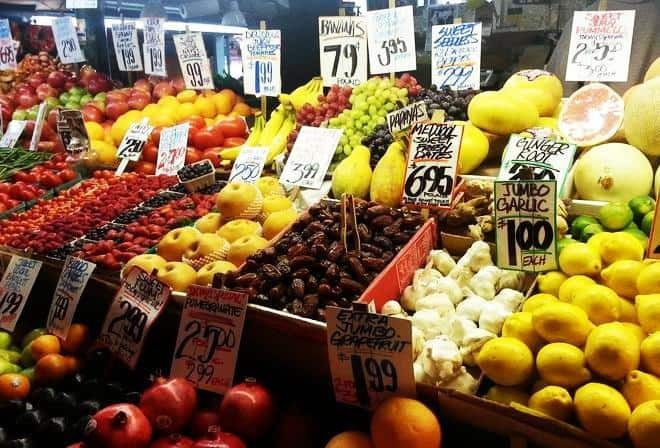 I haven’t seen produce that was fresher or better looking in a long time! Some of the fruits or vegetables I don’t recall seeing since my childhood in Uzbekistan over 15 years ago! Seattle is known to be one of the most vegan-friendly cities in the country, and I was happy to see that most restaurants had at least one or two vegetarian- or vegan-friendly items on the menu. 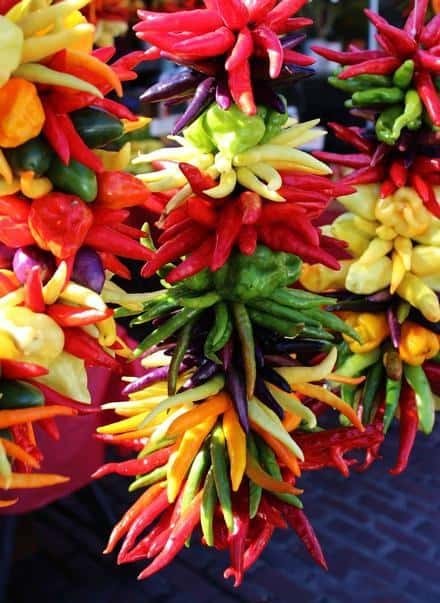 Pike Place Market has a lot of restaurants that represent cuisines from all over the world! Rob and I find that ethnic cuisines are usually pretty accommodating (if you know what to look for), so we were glad to find a tiny Mediterranean/Middle Eastern hole-in-the-wall place called Sabra that had all kinds of vegetables, falafel, and a dairy-free tahini sauce. 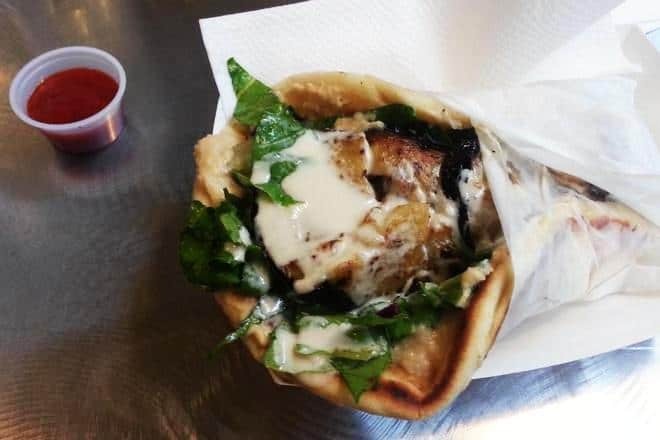 I had a roasted eggplant sandwich on pita bread (below), and Rob had falafel. The eggplant was roasted perfectly, and the falafel was easily the best I’ve tasted at any restaurant: not overfried, perfectly seasoned – yum! The only drawback we found with Sabra was that the servings weren’t very big and weren’t accompanied by any sides, so we got hungry again pretty quickly. Other than that, our food was delicious! Pike Place Market goes beyond being a quirky place where people buy and sell things. The Market has a special program that helps low-income people and families in the community. 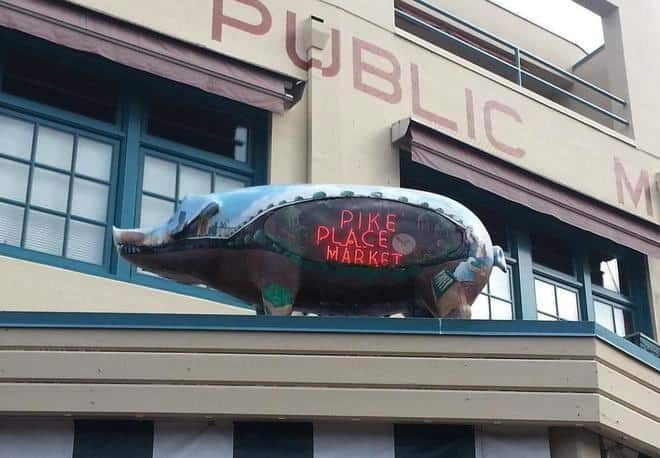 According to their website, the Pike Place Market Foundation “supports housing and services for our low-income neighbors by fundraising, advocacy, and community building”. The donations to the Market Foundation help support Pike Market Medical Clinic, Senior Center, Food Bank, Heritage House, Child Care and Preschool. Every year, the Foundation’s mascot, Rachel the Piggy Bank (a bronze piggy sculpture located in one of the busiest hubs of the Market) collects donations of cash, loose change and checks that add up to more than 15 000 dollars. All in all, we enjoyed our visit to Pike Place Market, the food we had at Sabra, and would definitely come here a lot if we lived nearby. Tagged history, Pike Place Market, Seattle, traveling, vegan lunch. Bookmark the permalink.